Luxuriously appointed 'upper end' self-contained serviced accommodation for just 2 couples (MAGNOLIA Executive Suite sleeps 1 couple, and CAMELLIA, a Superior Queen Room sleeps 1 couple). Queen beds with pillow-top mattresses, each Suite has its own en-suite bathroom and shared tho totally private access to Spa Bathroom. We do not cater for children - sorry. Marble Lodge is a Traditional, fully Hosted Luxury Bed & Breakfast - the Lodge building is set apart from the Homestead for total privacy. Breakfasts are served by your Hostess by candlelight in the imposing dining room of the adjacent Homestead. Open fires in winter, reverse cycle a/conditioning in all rooms for year round comfort. Set well back from the street on a large private Estate with extensive gardens, offering very quiet private location, and yet a short walk to Coffee Shops, Wine Bars, Restaurants, Pubs, Artisan Cheese shop and few minutes drive to locally grown dried fruits from Gully Gardens. Stunning accommodation, with a very high standard, is why a high return rate by International Guests continues. Proud to have been Assessed by AAA as 4.5 Star Traditional Hosted Accommodation, and awarded the T-QUAL Tick - Australia's symbol of tourism quality, by Australian Tourism. Visit our web site for numerous large photos of our B&B, our extensive gardens, as well as pictures taken in our friendly, community-minded township. Just over an hours easy drive from Adelaide, Angaston is a friendly village set in a valley of rolling hills overlooking the actual Barossa wine region. 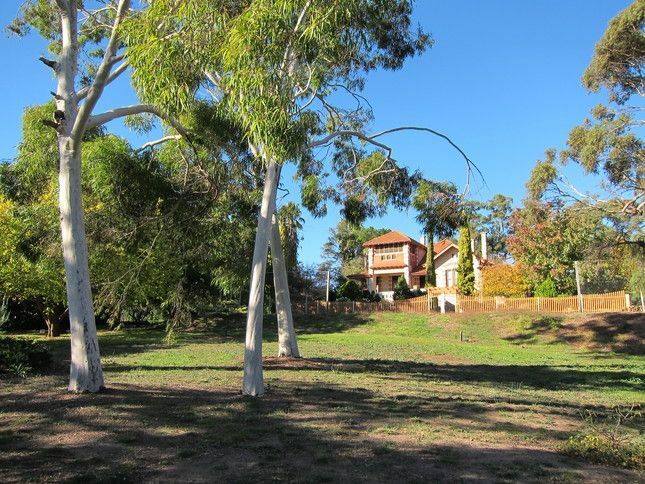 A beautiful property where numerous birds sing at dawn in a brilliant setting of young trees and ancient gums, nourished with so much care, love and effort. This large private Estate affords our guests a quiet and private stay, and yet a five minute easy walk to coffee shops, wine bars, pubs and great restaurants. NOTE: We prefer a minimum 2 night booking of a weekend. Easter Weekend we require a minimum 3 night booking. Closed over Christmas. Day Tours to Wineries available with pick-up from your door. Links can be viewed on our web site if interested. DISCOUNTS always offered for 3 or more nights. A bottle of wine is offered for stays of two or more nights. Famous Wineries with cellar door, coffee shops, wine bars, artisan cheese sales, Gully Gardens locally grown dried fruit sales a short drive out of town, and great drives through the ranges. Also a gem cutter and goldsmith a short walk from here. Heritage walks. Other walks in Parks nearby, an incredible number of birds call our huge gum trees their home. Extensive private estate with views. Up-market restaurants for fine dining just a five minute easy walk. A new bike/walking track the 6kms to Nuriootpa is a hit for those enjoying a brisk walk or ride through the scenery! No need to bring your bike, the local Hardware shop nearby, has great bikes for hire, spend the day enjoying the clean fresh air and superb scenery! Golf 14kms where all gear can be hired. Plenty of parking in front of your Room. Plunger Coffee maker, coffee provided also tea provided, milk jug will be found in your fridge. A toaster will be provided if required. Tea/Coffee cups provided, also plates and cutlery for snacks brought in including serviettes. Classic vintage charm, beautifully presented, clean. Warmest of welcomes, Shirley was so attentive and at the same time unobtrusive. Generous breakfast. Excellent position 5 minutes walk from Main Street but set in large grounds so was very peaceful and quiet. Would return and stay longer next time. Nice room, we got there late so was pleased to get to bed after all day driving. Thrilled you enjoyed your stay with us Shaune! After a long drive, the peace and tranquillity of Marble Lodge is something all of our guests have enjoyed in the 20 years we've been in business. A bonus of course is the closeness to the great restaurants in the main street, a 5 minute walk. Our break at Marble Lodge was really enjoyable. Everything we needed was at our fingertips. Our host Shirley was so obliging and Angaston was the perfect spot for a weekend retreat. Thank you Margaret for taking the time to review your experience at Marble Lodge. We appreciate your feedback and appreciation of what we've provided. I'm pleased my efforts were so well appreciated. It was a pleasure to have been of service to you and thrilled you enjoyed your stay.